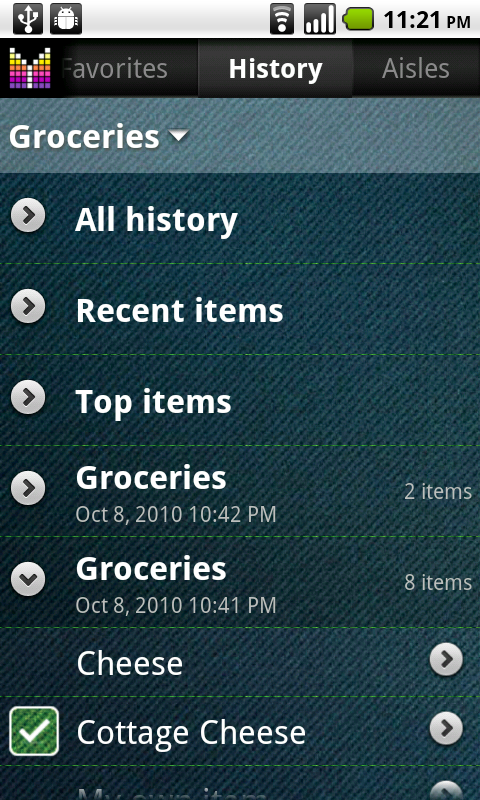 Favorites tab gives a quick access to items you buy most often. 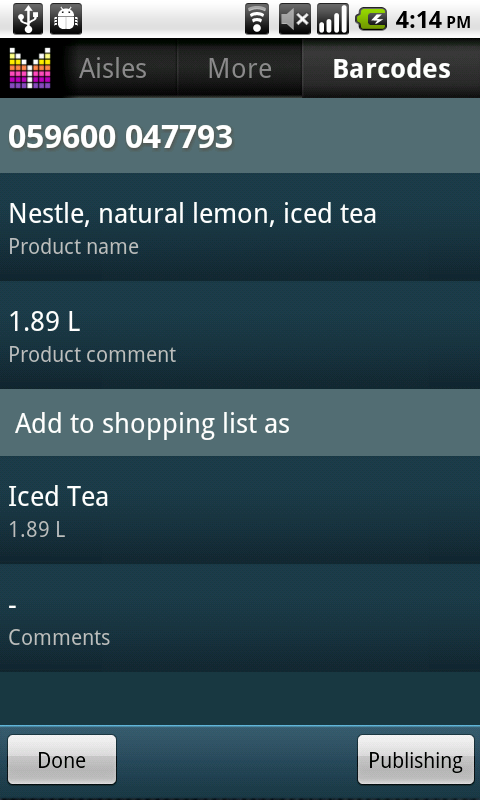 Just tap an item and it gets instantly added to the current shopping list. 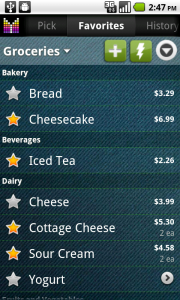 A yellow star indicates that item is added to the current shopping list. 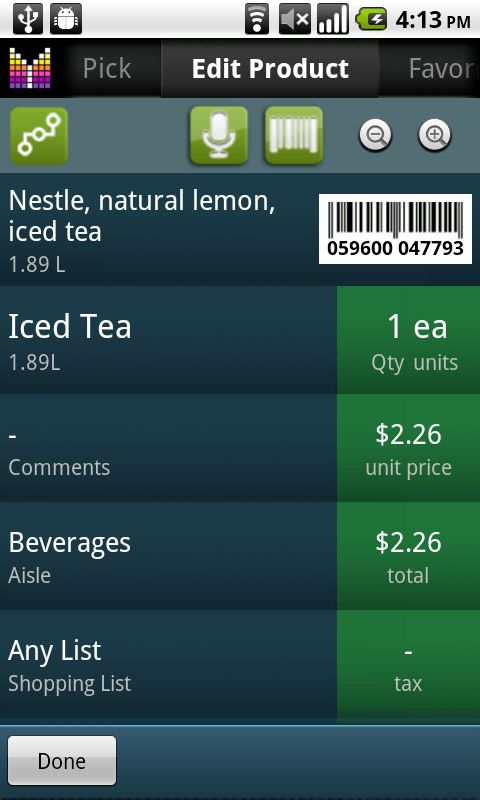 You can add items to Favorites as you would for any shopping list: Add button (plus), Voice input, Barcode scan. 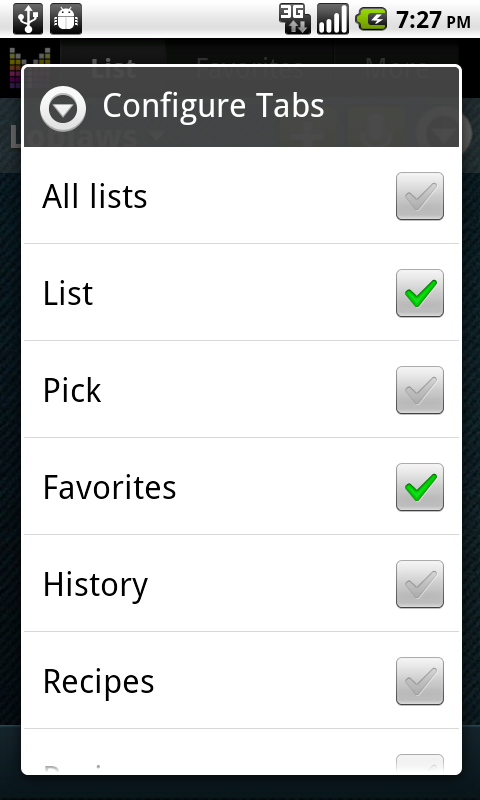 To populate Favorites from Pick list or History just select Favorites as destination list on top of Pick list or History and tap items you would like to get added. 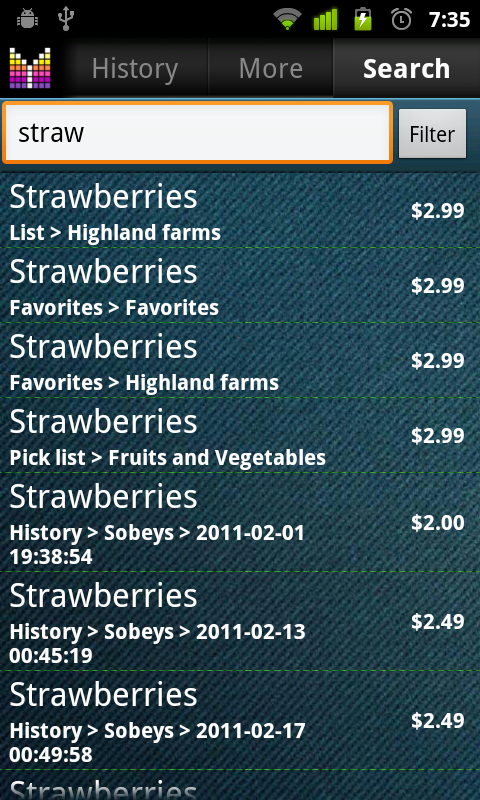 List-specific favorites feature allows you to associate a list of products with a certain store. 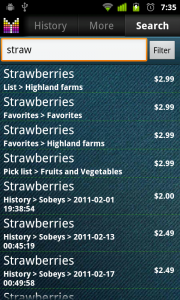 For instance, if you buy fruits from Whole Foods and milk from your local grocery store, with list-specific favorites it is possible to list fruits under Whole Foods’ favorites, and milk as favorite for your local grocery store. 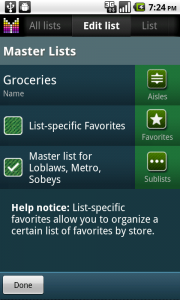 Please see Manage shopping lists User’s Guide for more details on how to configure list-specific favorites. 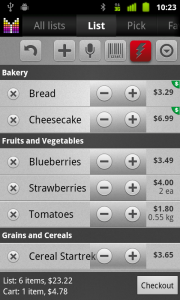 This section describes how to establish grocery data syncing between devices using Cloud. 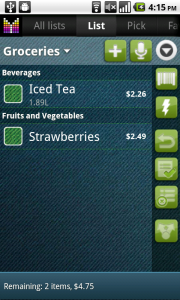 By “Cloud” we understand Mighty Grocery server infrastructure designed to store and process app-related data. 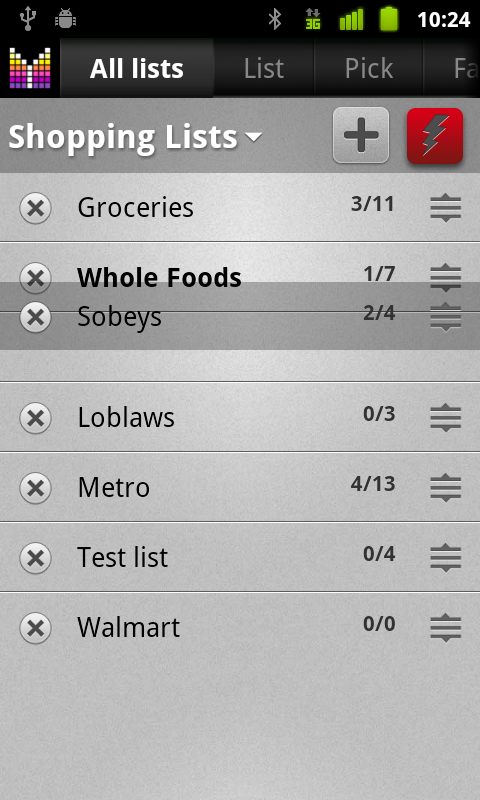 Online access to shared shopping lists: My Mighty Grocery. 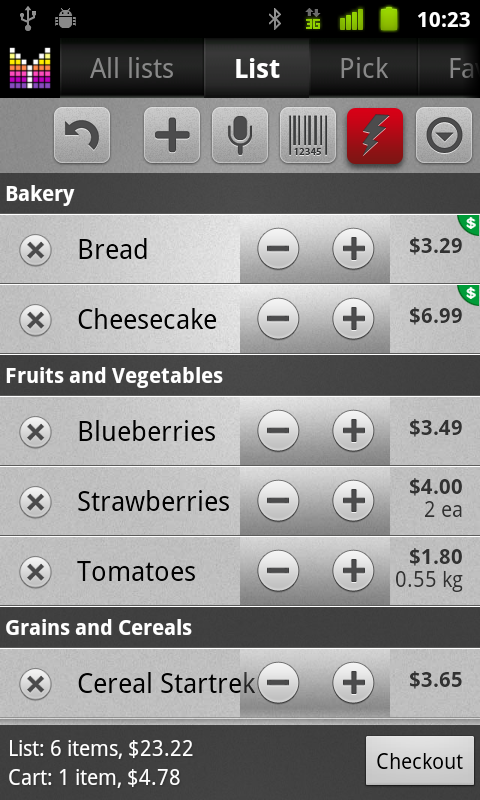 When you launch Mighty Grocery for the first time it will offer three options: Sign up, Sign in, Continue. To create an account: tap Sign up > enter Email & Password > Confirm. To sign in to existing account: tap Sign in > enter Email (or Account ID) & password > Confirm. 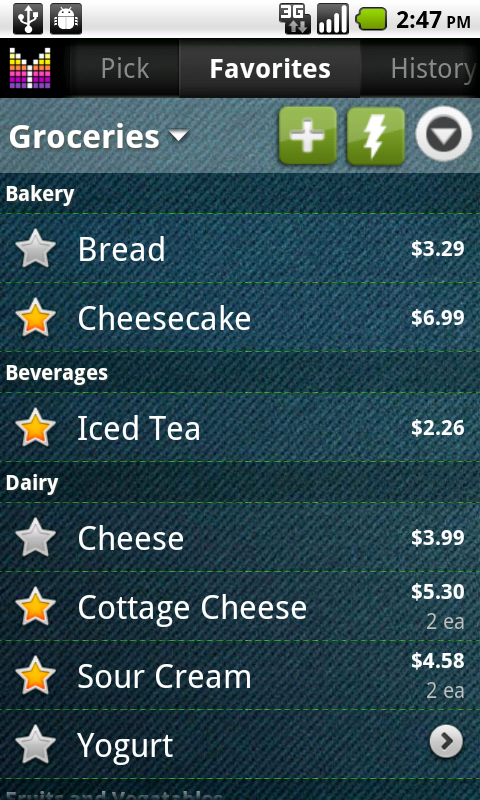 To continue using app locally without exchanging data with Cloud: tap Continue > the app will create a new local account for you. 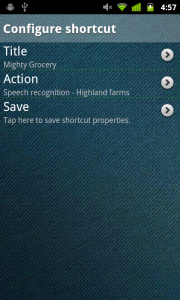 Sign up to MG account on one of your handsets to create an account. 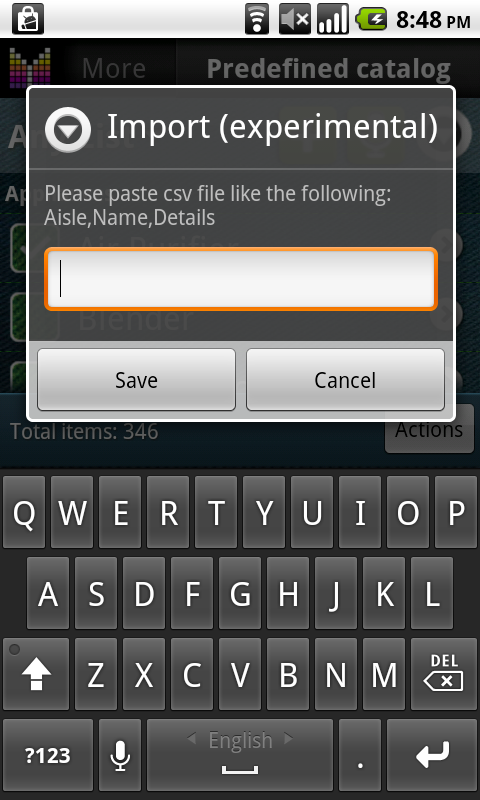 Sign in to the created account from all other devices. Once you connected devices to Cloud, all your grocery data will be synced automatically between handsets, including Lists, Pick list, History, Recipes, etc. 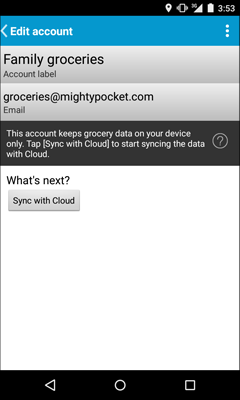 Go to Settings > Accounts > your account > tap [Sync with Cloud]. 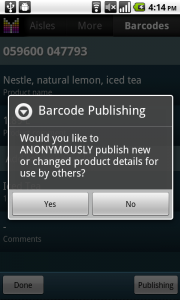 A new account will be created for you on Cloud. 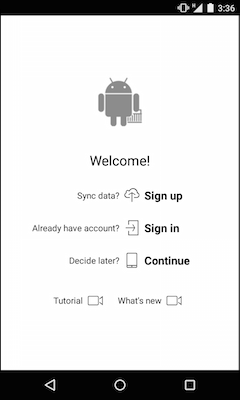 If you already have an account on Cloud and would like to sync data with a new device, just Sign in to the account from Welcome screen on the new device. You can Sign out from all accounts listed under Settings > Accounts. And then Sign in from Welcome screen. You can Sign in to the account under Settings > Accounts > Actions (3-dot button) > Sign in. To Sign out from account just go to Settings > Accounts > [your account] > Actions (3-dot button) > Sign out > choose No to keeping data on the device (unless you’d like to make a local copy of your data and create a new account from it) > Confirm. 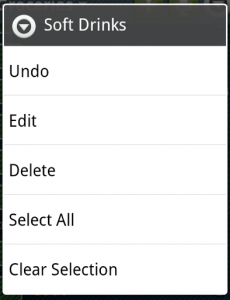 The above sequence of actions will remove account’s data from your device, but account will remain on Cloud. If any of your devices is signed in to your account you can change it under Settings > Accounts > your account > Owner password. Otherwise you can restore password under Settings > Accounts > Actions (3-dot button) > Restore password > enter Email > Confirm. 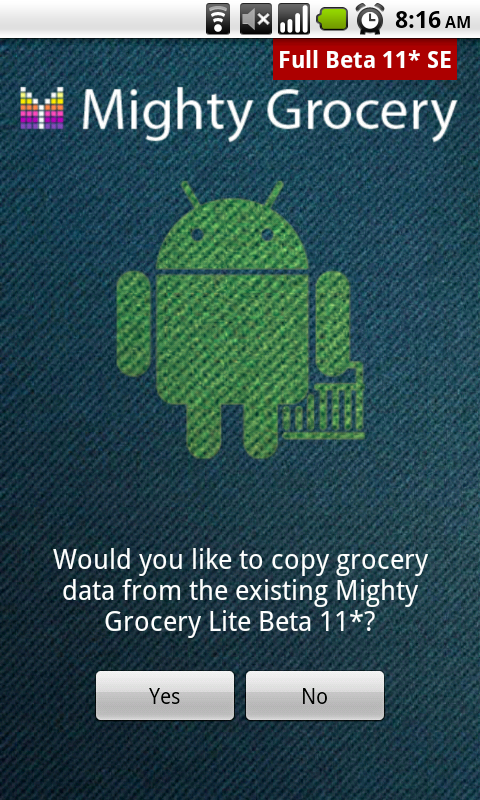 Note: If you have a Full Version of Mighty Grocery you don’t need to pay for the app again when installing it on a new device. 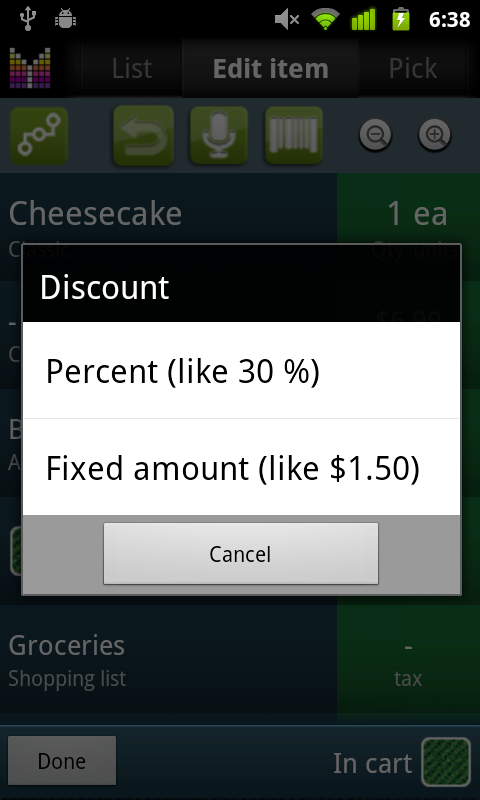 Just make sure you use the same Google Account with Google Play to download the app. For more details please see Google’s help. 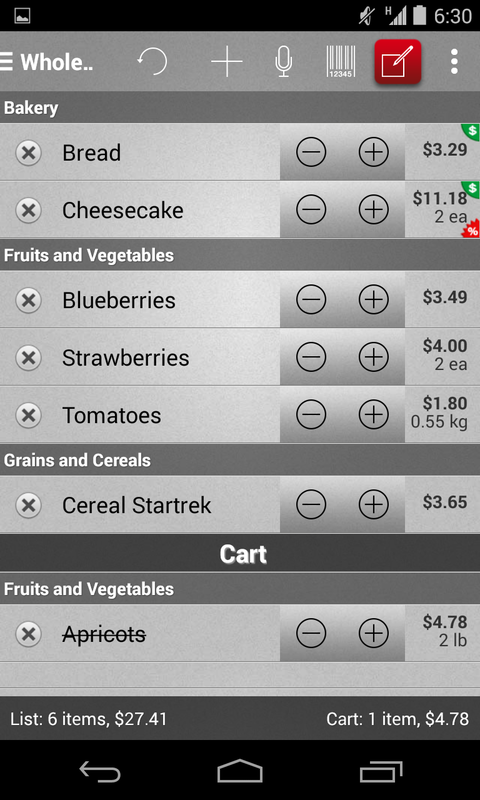 Just a reminder: if you purchased the app from Amazon Appstore you need to download Mighty Grocery from Amazon. 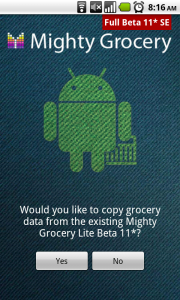 Make sure you device is running the latest version of Mighty Grocery. Make sure that you have account on Cloud and it is syncing normally. Just go to Settings > Accounts > your account > check that status is “Success”. 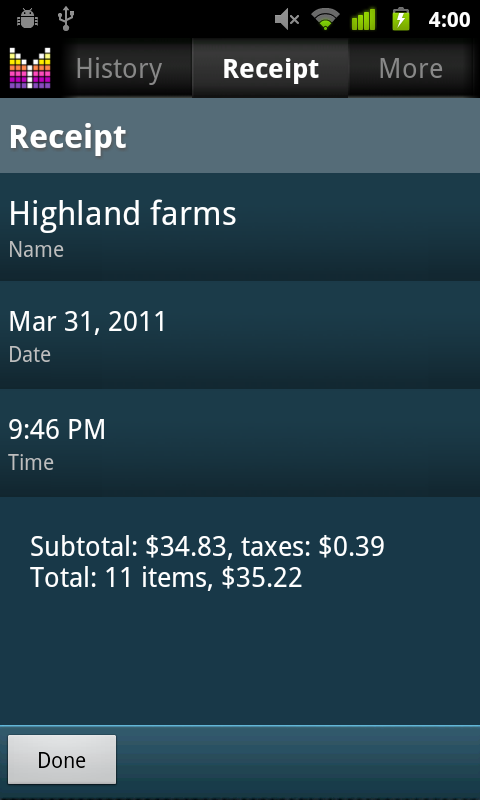 If your account is local, please see Sync Existing Local Data. Make sure that entered Email is correct or tap [Email] field to make changes. 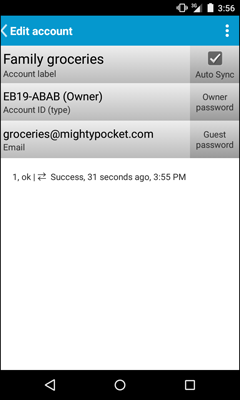 Tap [Owner password] field > enter your password. Sign in to your account from Welcome screen. 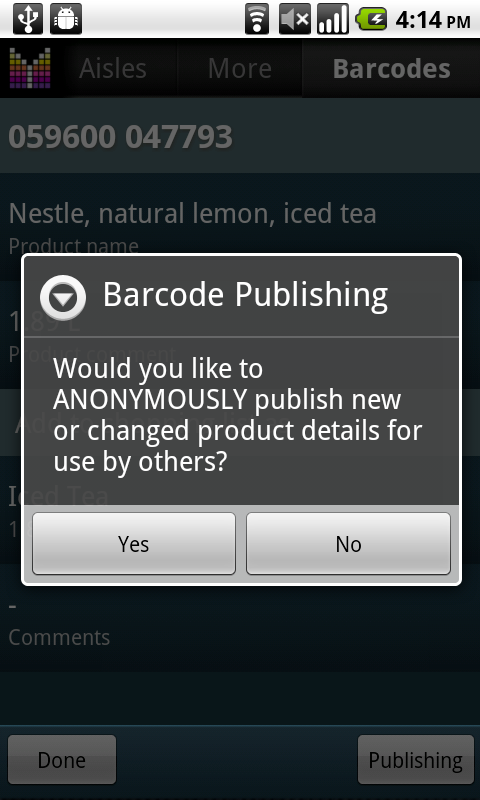 See Sign In to Account section for more details. Account settings (such as Account label, Email, Password) can be changed under Settings > Accounts > your account. Account ID can be used to sign in to your account instead of Email. 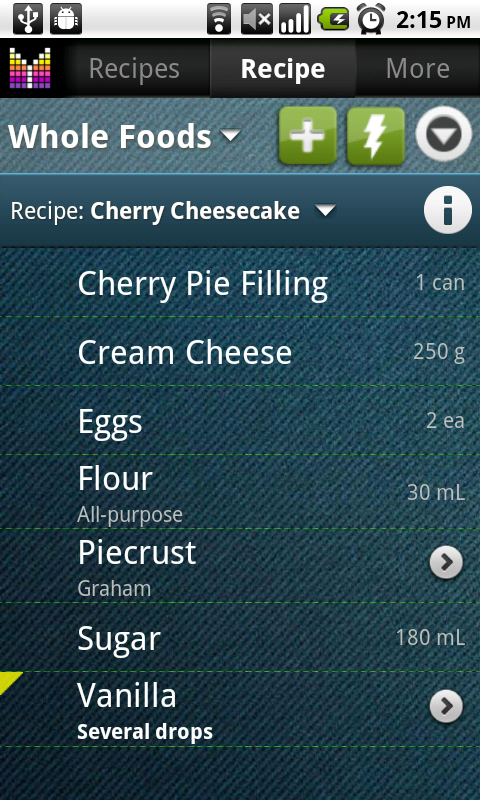 Your account can have Owner password and Guest password associated with it. If you created the account or used Owner password to sign in to your account, you are granted Owner access and you can make any changes to the account. Users who sign in using Guest password are granted Guest access and are not allowed to change account Passwords, Email, and Account label. 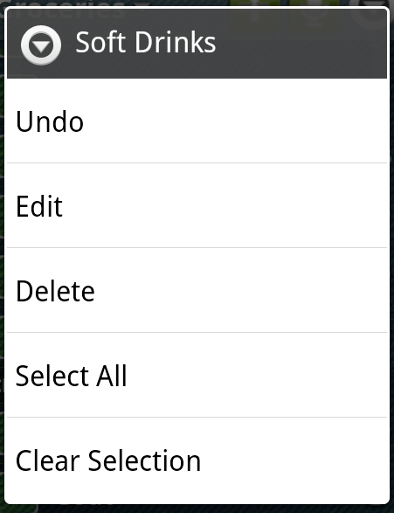 If you’d like to delete account from Cloud, go to Account Settings and choose Delete from Cloud option from Actions (3-dot button). 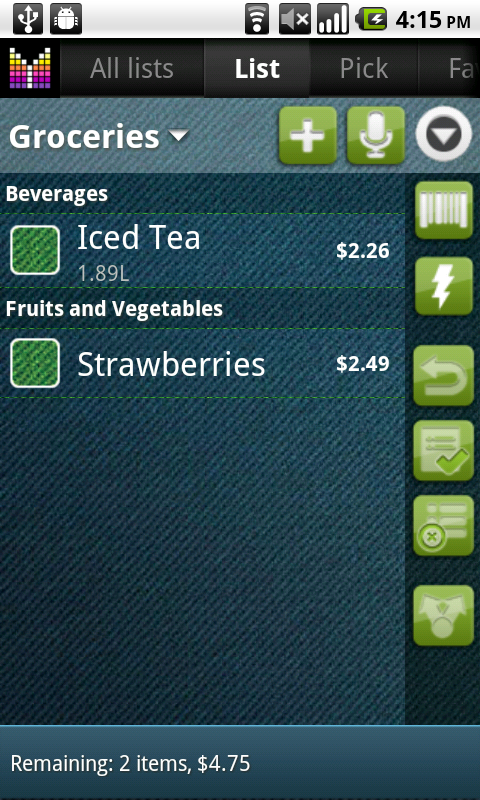 Your devices are running the latest version of Mighty Grocery available for download (currently 4.0+). 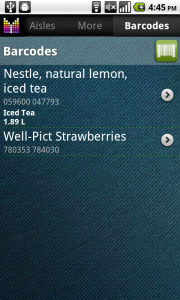 Devices are signed in to the same account. 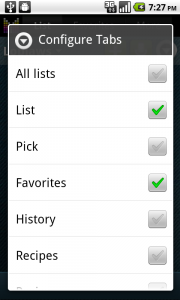 You can check this by comparing Account Ids listed on the devices under Settings > Accounts. 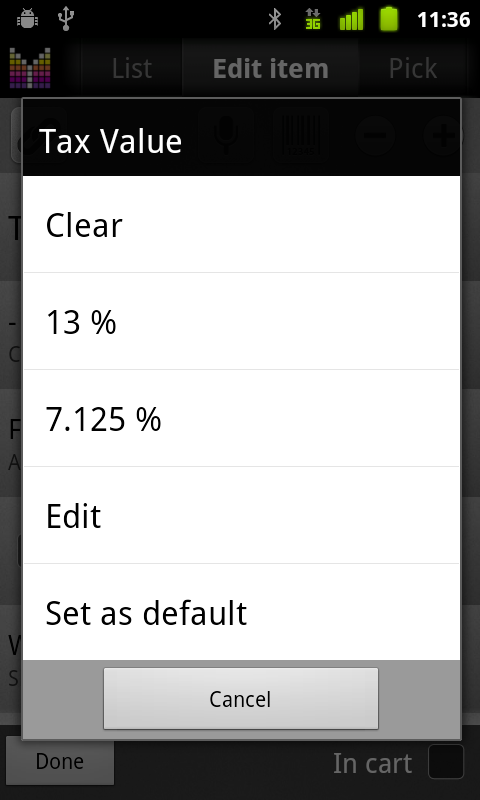 Sync status should be “Success”: check sync status under Settings > Accounts > your account. If this didn’t help, please email your Account IDs to hi@mightypocket.com with details about the issue so we could have a closer look. 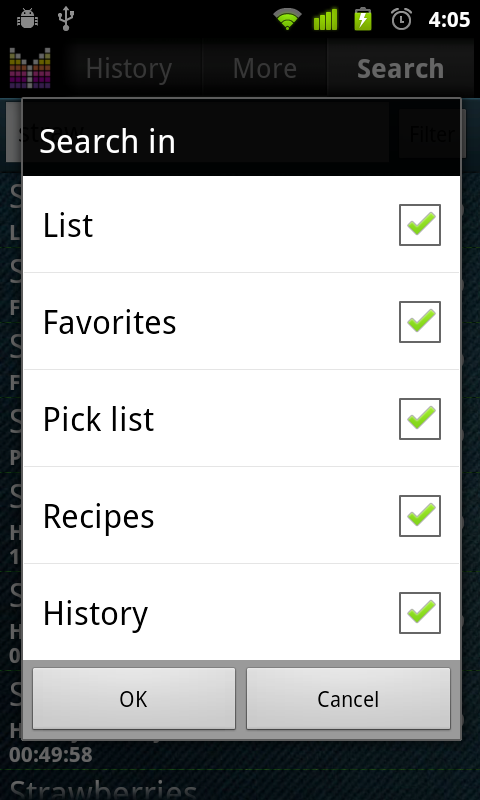 List Sync Settings are accessible from Menu –> Settings –> List Sync. 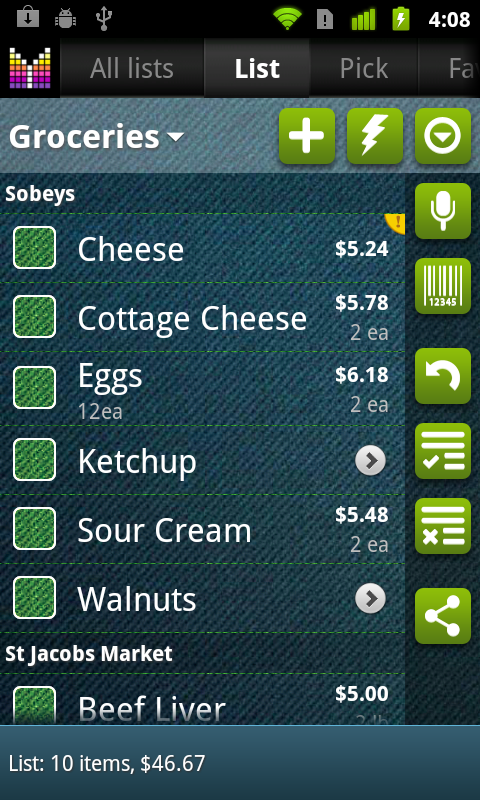 Polling interval — number of seconds between sync attempts when shopping list screen is open. 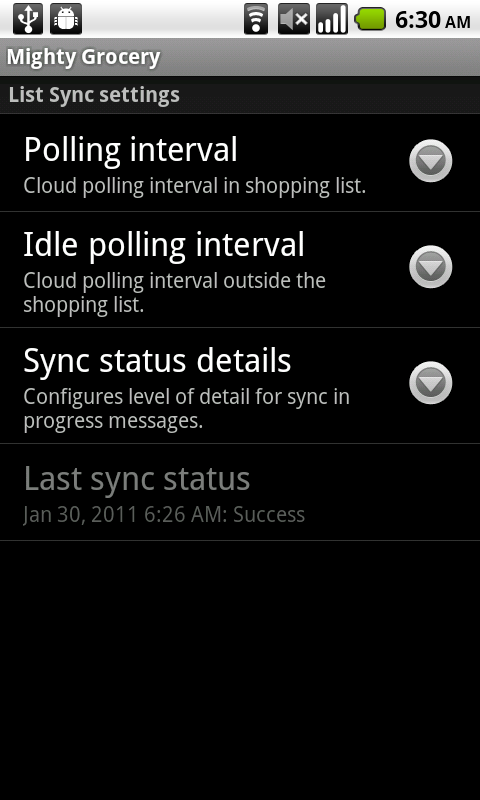 Idle polling interval — number of seconds between sync attempts when shopping list screen is closed. 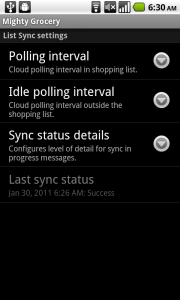 Sync status details — configures level of details of progress messages. 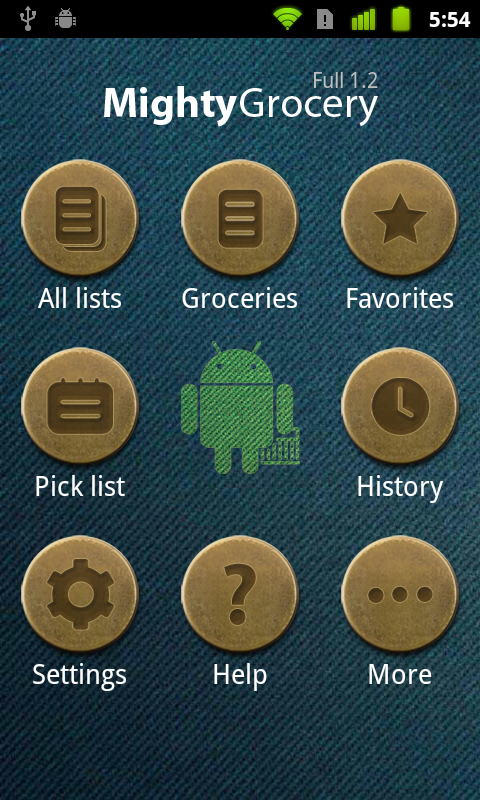 Can be None, Simple, and Detailed. 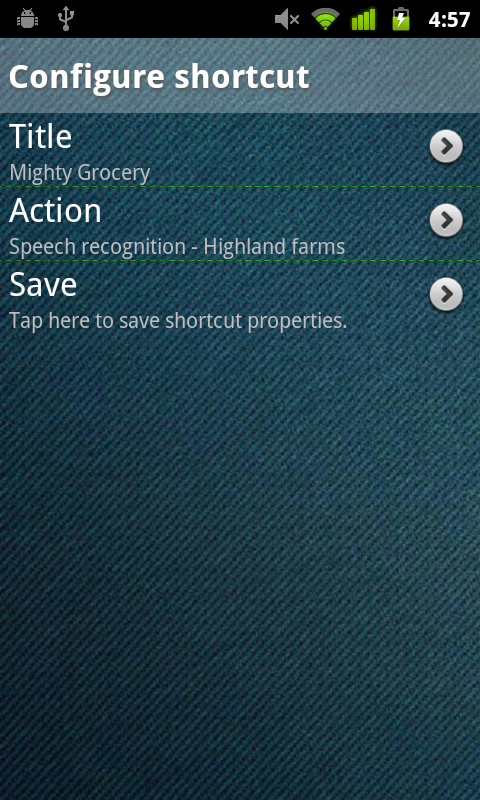 Starting with Mighty Grocery 4.0 the app will store backups of your data on SD card only. If you’d like to keep your data safely on Cloud, make sure that syncing with Cloud is activated. Backups can be created and restored under Settings > Backup. 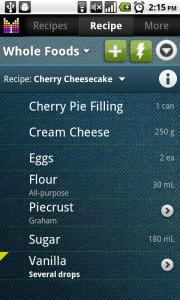 Choose Create backup to initiate backup creation. Choose Restore backup to restore previously created backup in your app. 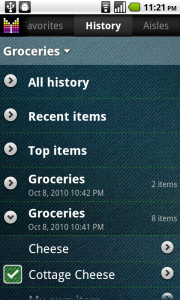 Choose Share backup if you’d like to send one of backups from your SD card to someone else. 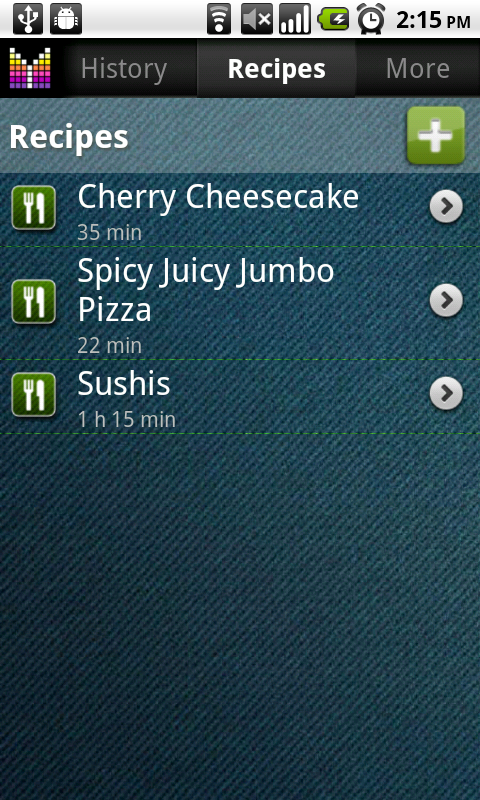 5 last backups are preserved and the app automatically creates backups every once in a while. 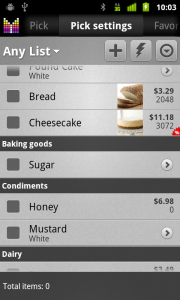 Search feature allows finding your items by name in shopping lists, favorites, pick list, history, recipes. To open Search tab, go to More tab and tap Search. 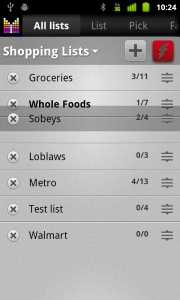 Also, it is possible to make Search tab always visible using Configure Tabs feature. 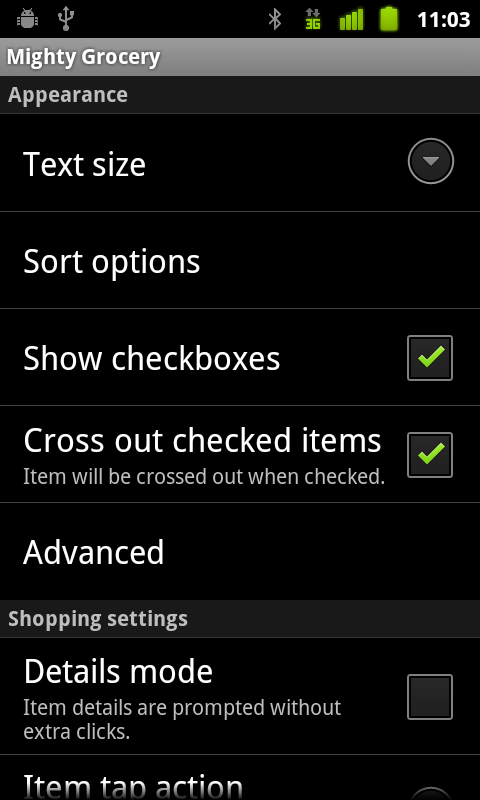 Search selection refreshes as you type in the Search box. 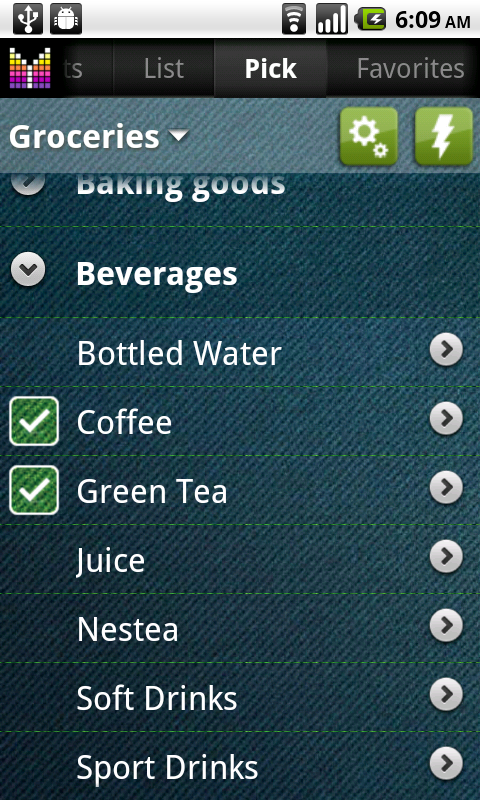 Tap Filter and choose the search scope which is a multiple selection of shopping lists, favorites, pick list products, history, recipes. 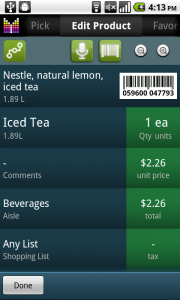 Tap any row to bring up Edit Details screen. 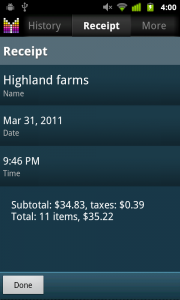 Long-tap any row and popup menu shows up. It is possible to Undo (same as Menu –> Undo), Edit (same as single-tap on a row), or Show original. 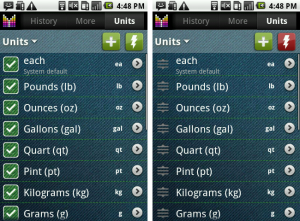 Show original command opens corresponding tab which contains currently selected item and highlights the original row. Undo — reverts the latest change operation. 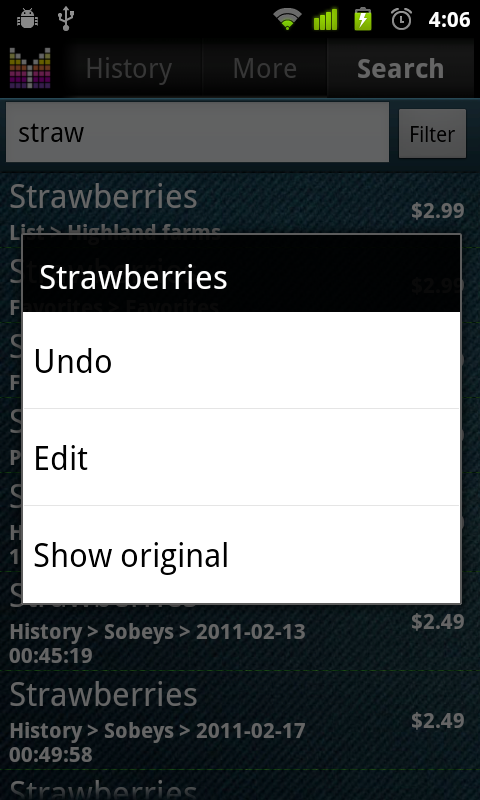 Same as Menu –> Undo. Edit — opens Edit Details tab. Same as tapping on a row. 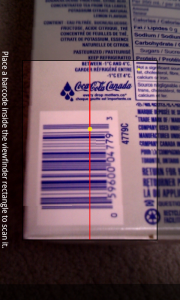 Show original — opens corresponding tab which contains currently selected item and highlights the original row. 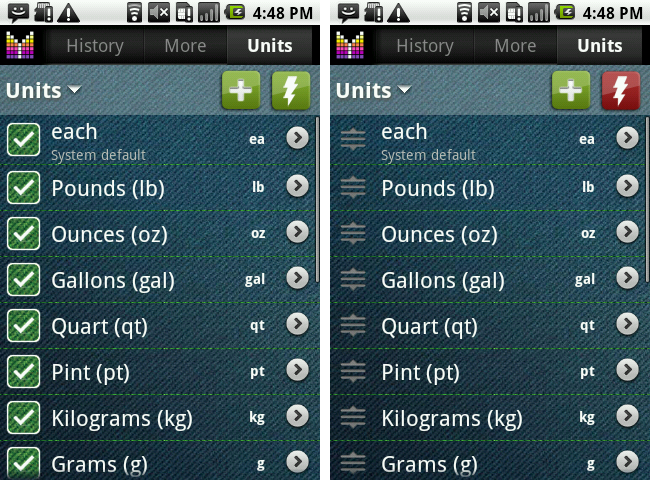 While on the Search tab, tap Filter. 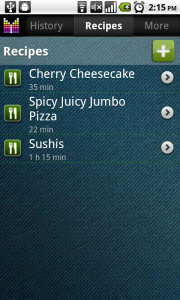 Scope selection dialog shows up. Set check against rows that you want to be included in search results. 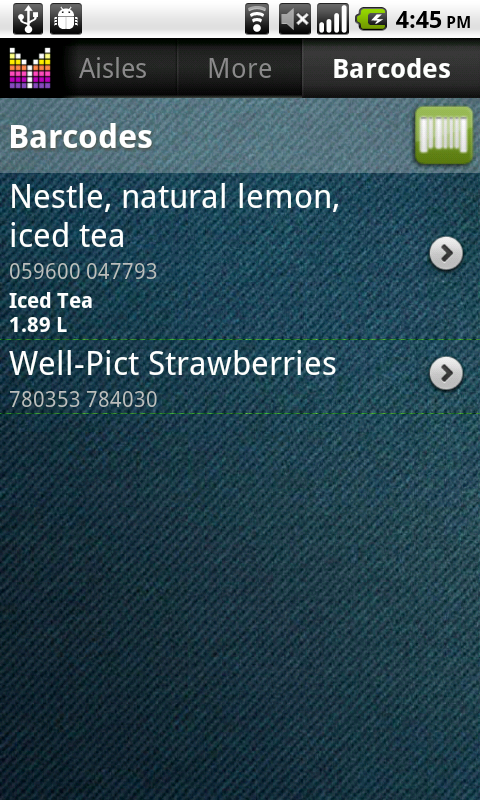 Your search results will be instantly refreshed. 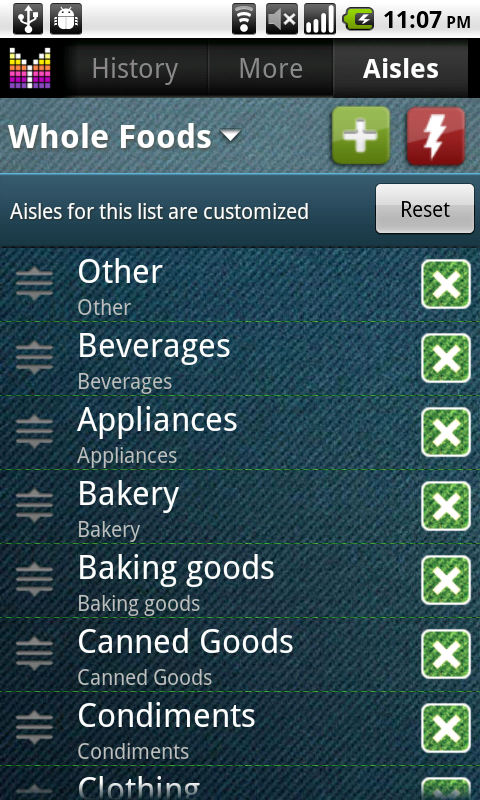 Aisles Activity allows you adding, hiding, renaming and sorting aisles (departments) in your Android shopping lists. 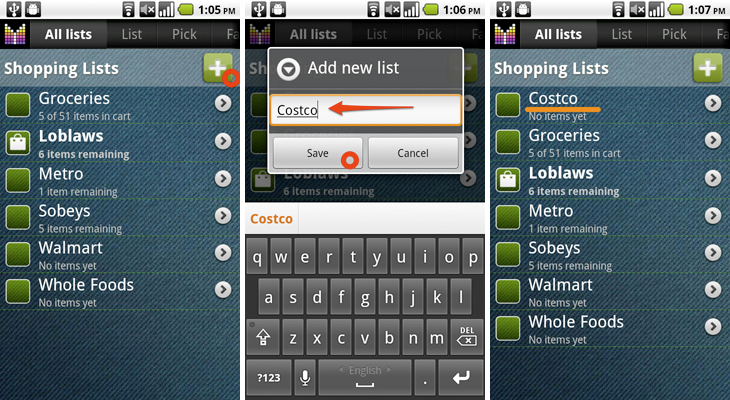 Aisles tab is accessible through Menu –> Settings –> Aisles. 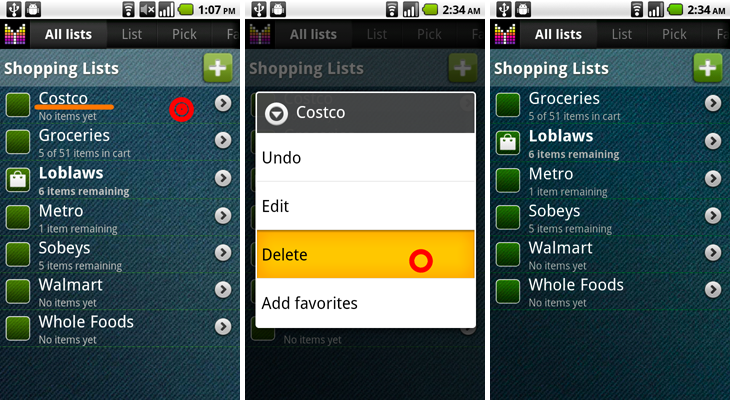 Important note: selector on top contains lists with customized aisles only. 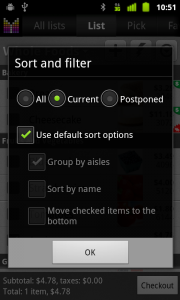 To change aisle order and/or delete aisles, click Lightning button to turn edit mode On. 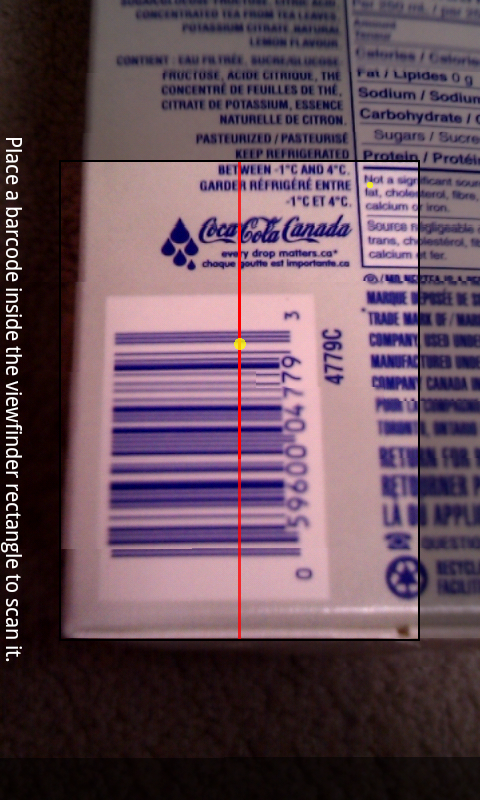 Grab the handle on the left of an item and move it to the position you want. 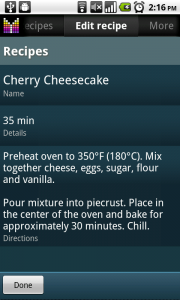 Click Lightning again to turn edit mode Off. 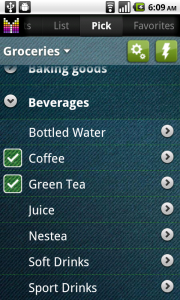 To add a custom aisle, click Add button (green plus) and enter new aisle name when prompted. 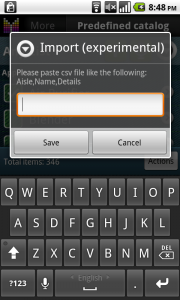 To delete aisle long click the aisle and select Delete from Context Menu. 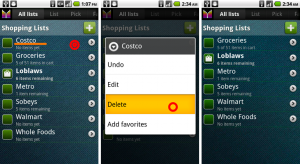 To hide aisle (from search and Pick list) click an aisle so that it is crossed out and hidden from Pick list and search. 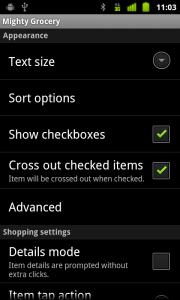 Clicking crossed aisle again will show it back in Pick list and search. 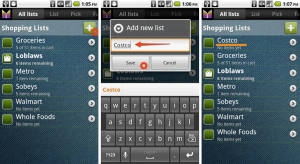 To rename aisle click the button on the right of the aisle to get to Edit Aisle screen. Then enter a new name for the aisle. To sort aisles by name click phone Menu button –> Sort by name. 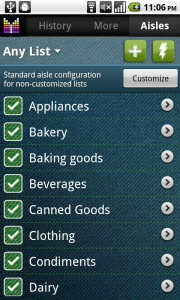 By default all shopping lists use the standard aisle configuration. 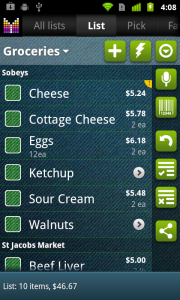 Sometimes you may want to reorder, hide or create new aisles for specific shopping lists. 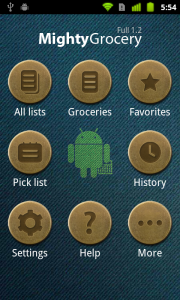 The following scenario explain how to do such customization. 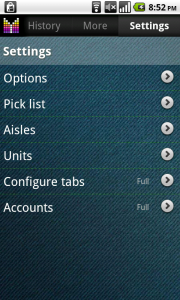 Open Aisles tab with Menu –> Settings –> Aisles. 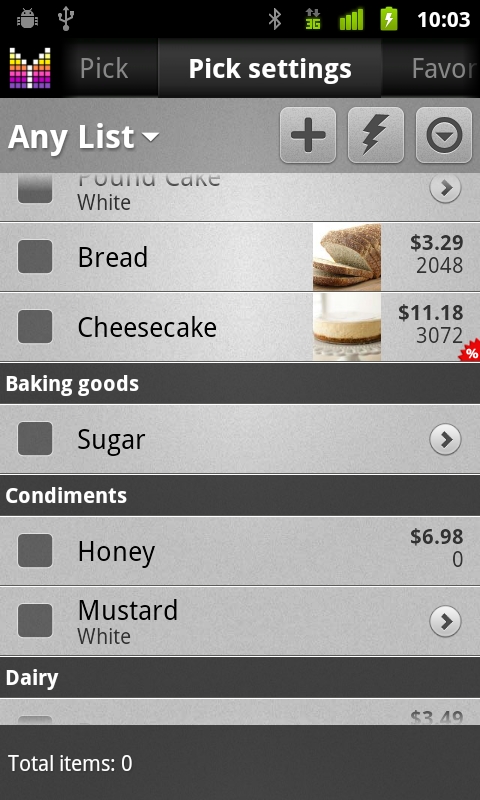 Click Customize –> Select the shopping list you want aisles to be customized for. 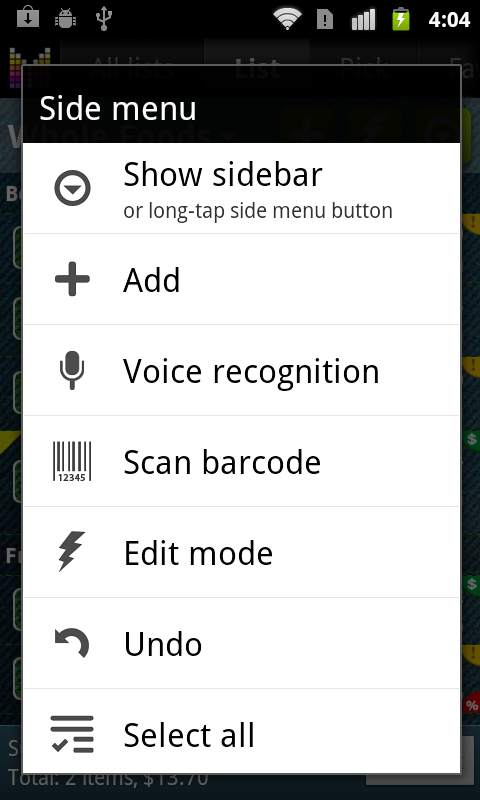 Activate Edit mode by clicking a lightning button. 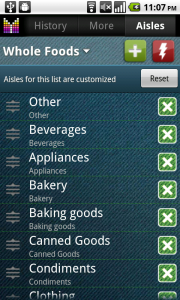 Make changes such as reorder aisles, hide/show, delete, add, or rename aisle. 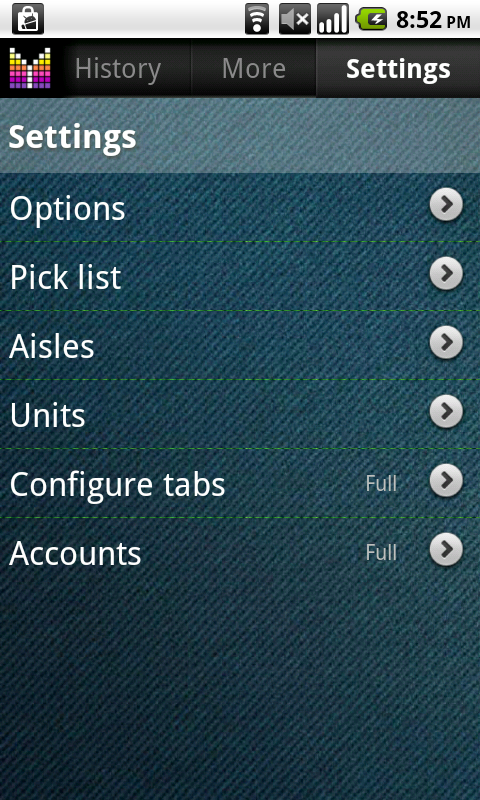 If you want to revert to the standard aisle configuration, click Reset. 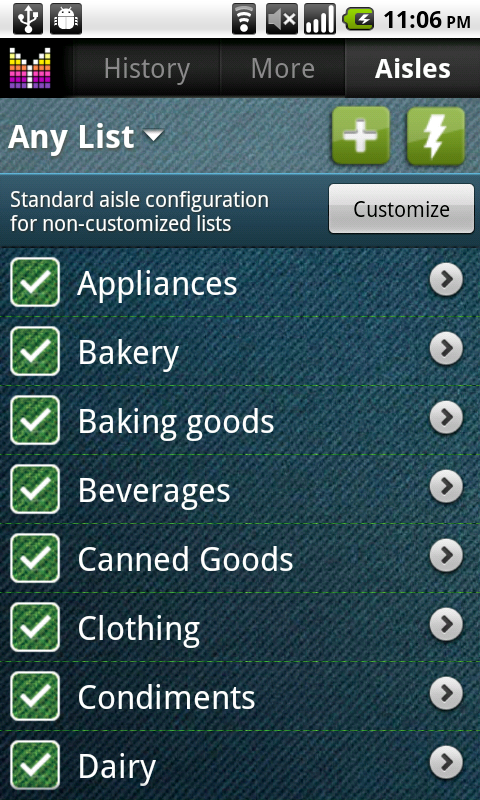 Parent aisle field is used to link aisles from customized configurations to aisles from Any list configuration. 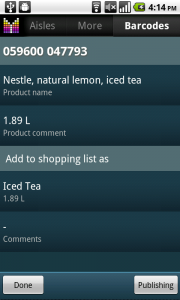 This may be helpful if you decide to customize aisles for a list to change aisle names and/or order, but still want to use the same set of products in Pick list. 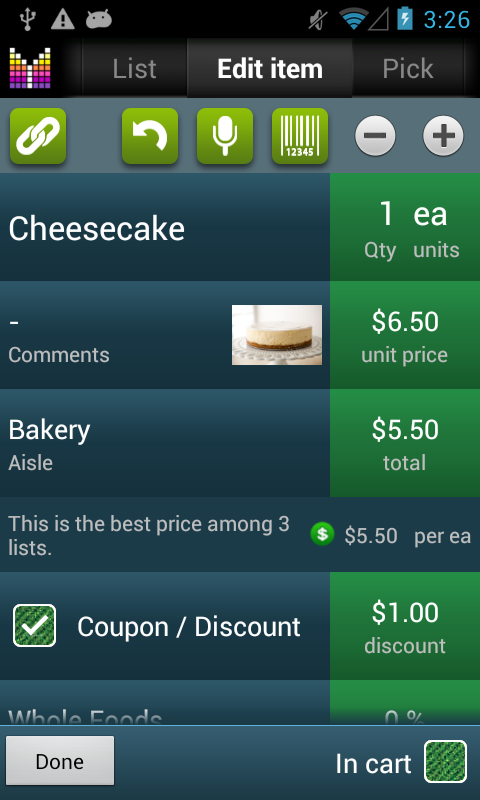 For instance, imagine that Whole Foods list has customized aisles and there is a Bakery aisle in Any list. 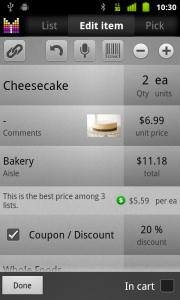 Option 1: Bakery aisle of Whole Foods links to Any list’s Bakery. 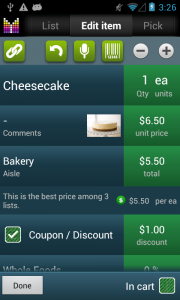 In this case any item/product assigned to Any list’s Bakery will be available for Whole Foods list under Pick list. Option 2: Bakery aisle of Whole Foods does NOT link to Any list’s Bakery. 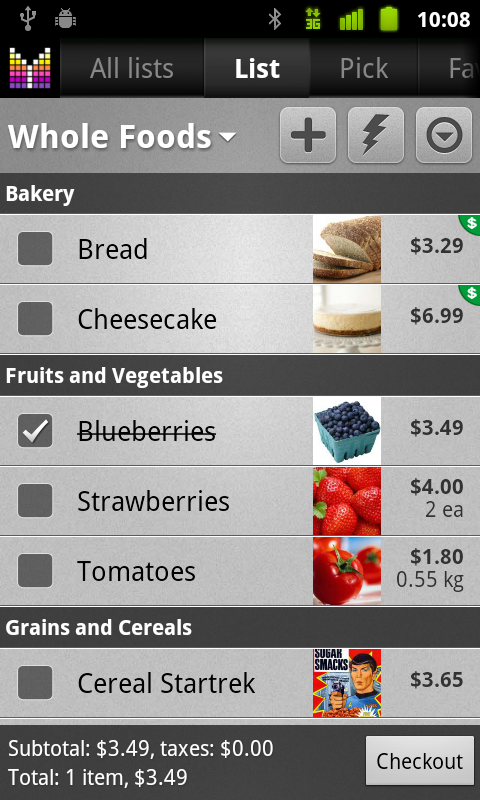 In this case Bakery aisle for Whole Foods will contain its own set of items under Pick list.